Sweet potato is a root vegetable which has many health benefits. It can be roasted or boiled or steamed, whatever the way you cook, it is one of the healthiest foods in the world. Sweet potatoes are a good source of vitamin A, C, B2, B6 and minerals. This healthy food has anti inflammatory, anti bacterial, anti fungal properties. It also has anti oxidants. There are many varieties of sweet potatoes around the world. These are available in yellow, white, orange, red, purple, wheatish and many other colors. white and yellow sweet potatoes are a bit less sweet when compared to others. 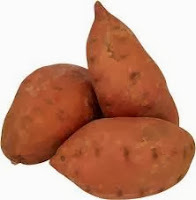 American diabetes association recommended sweet potatoes for diabetes patients. It's properties control the sugar levels in blood. The abundant fibre helps in lower glycemic index. Also the natural sugars in sweet potatoes dissolve slowly into blood producing constant energy. The high fibre content in this root vegetable also helps in preventing bad cholesterol and constipation. It also cleans the digestive system. Vitamin B6 slows down the release of homo-cysteine in the body, which is associated with many diseases including heart attacks. Like citrus fruits, sweet potatoes are also good source of Vitamin C. It is also a source for Vitamin D, which can also be gained from sunlight. It helps for good bone and teeth health. Sweet potatoes contain minerals like magnesium and potassium which helps muscle and nerve functioning. Orange colored sweet potatoes are rich in carotenoids, which helps to improve eye health. These are helpful for people with Vitamin A deficiency. Anthocyanin an anti oxidant associated in purple sweet potato is considered as a cancer fighter and also increase immunity.